Hooray for Avon Brochure 17 because it launches 6 new sparkly shades to the True Colour Nailwear Pro+ range! I’ve got two to share with you today, Shimmering Silver and Twinkling Bronze. They are spectacularly sparkly, perfect for the party season. Half price at only £3, these are a cracking good buy, dazzle up your nails to accompany your sparkly festive outfits. I applied two coats and have taken photos with and without camera flash so you can see what the shades look like under natural light. 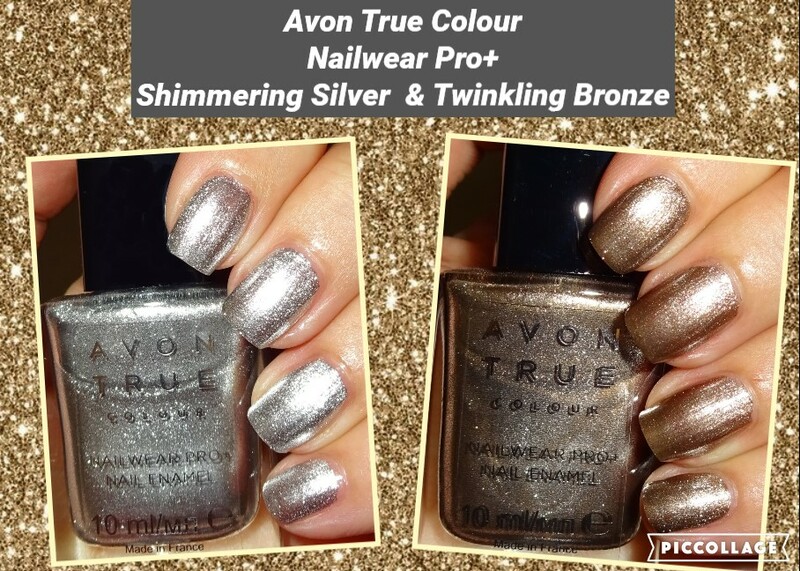 Shimmering Silver is a dense full on sparkle shimmer, my nails look like they’ve been dipped into precious metal. The image in the brochures makes the enamel look white, (well that’s what I thought) but it’s oh so very silver. Twinkling Bronze is a frosted taupe, again slightly different to the brochure which I think makes it look peach. This is very much a metallic bronze. Below, no camera flash, natural light. They applied like a dream, come in a 10ml bottle and have a nice slim cap. I can’t wait to try the other 4 new shades – do you have any of them?